but lasts and lasts throughout the entire boat season. Snappy sealer is not a simple teak oil but an advanced polymer using as its base the finest of teak oils. When it dries it creates a barrier to dirt leaving a beautiful finish that will outlast regular teak oils. Further it will not darken as many teak oils do. Naturally the formula even contains UV inhibitors which not only prevents the sealer from breaking down but even preserves the teak against the damaging effects of UV radiation. 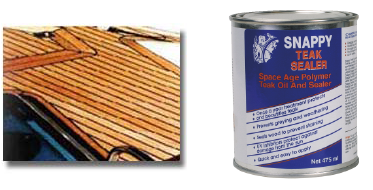 Snappy Sealer is easy to use; After restoring the teak with Snappy Teak-Nu, just spread Snappy Sealer along the grain with a sponge. Only requires one coat. The Sealer contains special pigments to give the teak a warm golden finish.